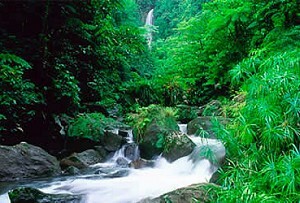 Trinidad is lush with rainforest, offers rolling hills, cool waterfalls, and spectacular birdwatching opportunities. More than 430 bird species are found there. Trinidad's people are a fascinating, heterogeneous mixture of Amerindians, Europeans, Africans, East Indians, Chinese, and Middle Eastern descendants which influence the culture and cuisine. Tortola, "land of turtle doves' or Chocolate City is the largest of the British Virgin Islands overlooking Sir Francis Drake Channel and situated about 60 miles east of Puerto Rico. Its most popular point of entry for vacationers is the East End Beef Island Airport linked to the capital city of Road Town by the one-lane Queen Elizabeth Bridge. Road Town's scenic setting and sheltered yacht-filled harbour provide a helpful orientation to the laid-back BVI lifestyle evolved over the last 400 years by English, Dutch, French, and Spanish adventurers, followed by plantation owners and 20th century settlers. This friendly and diversified community tempts travellers with every sort of regional and international cuisine found in a choice of cheerful pastel painted restaurants, former forts, and sugar mills. Palate-pleasing menus feature West Indian specialties of fresh lobster, conch, turtle, spicy goat, and curries of every description. An authentic English pub serves Pusser's Rum, traditional drink of the British Navy for 300 years, as well as a popular fruit flavoured local concoction known as the "Painkiller". Tobago is part of the twin island nation of Trinidad & Tobago and possesses an array of natural wonders and wildlife - including more than 425 different species of birds. The island is graced with mountain ranges, rivers, mangrove swamps, tropical savannahs, and a marine environment influenced by the Orinoco River. Tourism in Tobago is booming. It is serene with its swaying palms and fishing villages, sandy beaches and coral seas teeming with fish. The island moves at a more leisurely tempo than does Trinidad but with a similar kind of unspoiled scenery and uncrowded atmosphere. 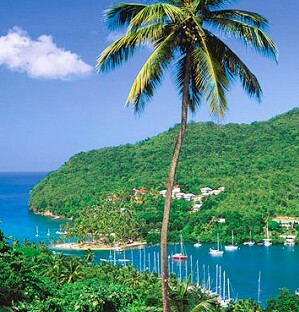 St. Vincent is a lush, tropical island, with steep mountain ridges, rainforests, and waterfalls. Its rich volcanic soil produces an abundance of fruits, vegetables, and spices making it an agricultural paradise. St. Vincent’s capital city, Kingstown, combines reminders of its colonial past with the bright and bustling life of a modern market town. The population of St.Vincent is estimated to be 109,022 with about a quarter of the people living in the capital, Kingstown and its suburbs and 8% on the Grenadines. The ethnic mix consists of 66% percent of African descent, 19% of mixed race, 2% Amerindian/black, 6% East Indian and 4% European. The labour force is estimated at 41,000. 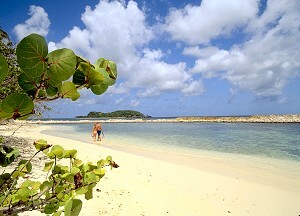 With an area of only 37 square miles, the island of St. Maarten/St. Martin is the smallest land mass in the world to be divided between two governments. Its dual owners are the Dutch and the French, who have shared the tiny and paradisical island more or less peacefully for almost 350 years. This understated absence of conflict testifies to one of the island’s most precious and attractive characteristics—its unusual serenity. Situated about 150 miles east of Puerto Rico, Dutch St. Maarten (the French spell it St. Martin) covers 16 square miles of the southern part of the island, an area marked by verdant, rolling hills that languidly rest above mile after mile of beach, salt pond, and lagoon. Although the region falls under the government of Netherlands Antilles and the Kingdom of the Netherlands, its diversity and the strong influence of West-Indian traditions make its culture, anything but exclusively Dutch. 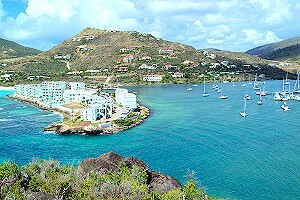 St. Maarten’s atmosphere is a winning blend of Caribbean hospitality and European sophistication. St. Lucia has often been described as an island of surprises and rightfully so, as there are many delights for varying tastes as you journey around this picturesque 238 mile island paradise. A small, lush tropical island that is still relatively unknown. 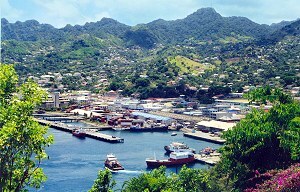 St. Lucia is located midway down the Eastern Caribbean chain, one of the Windward Islands of the Lesser Antilles, between Martinique and St. Vincent, and north of Barbados. The Atlantic Ocean lies on its eastern shore, the west coast lies on the Caribbean Sea. Martinique is the home of Fort de France, a cosmopolitan city with a pace that is fast for the tropics. It rains every day on Martinique, and the vegetation is lush and gorgeous. Martinique has an agrarian economy, with sugar cane, pineapples, and bananas being the money crops. While Fort de France is on the western Caribbean side of the island, La Trinité is on the eastern Atlantic side. Martinique is home to an active volcano, Montagne Pelée, which erupted in 1902, killing everyone in the town of St-Pierre except the town drunk who had been thrown in jail. The ruins of old St-Pierre have been preserved, and a statue of a woman who's clothes are falling off has been erected to commemorate the victims of the eruption. At the time of the eruption, St-Pierre was the capital of Martinique, and its beauty was such that it was known as the Little Paris of the West Indies. It was totally destroyed along with its 26,000 inhabitants. After the destruction, the capital was moved to Fort de France, where it remains, and the new St-Pierre is a pleasant village with splendid views of Montagne Pelée in one direction and the Caribbean in the other. Grenada is a rolling, mountainous island, covered with fragrant spice trees and rare tropical flowers. Bordered by stunning beaches, and dotted with picturesque towns, this verdant island has long been a major source of nutmeg, cloves, ginger, cinnamon, and cocoa. The seductive drifts through the colorful Saturday markets and Grenada's dense forests. The capital, St. George's, is widely held to be the loveliest city in the Caribbean. Its horseshoe-shaped harbor is surrounded by a pastel rainbow of dockside warehouses and the red-tiled roofs of traditional shops and homes. Dominica (pronounced "Dom-in-eek-a") is an island of volcanic origins located between the French islands of Guadeloupe and Martinique in the Eastern Caribbean, at approximately 15 degrees North and 61 degrees West. It is the largest and most mountainous of the Windward Islands. It is the largest and most mountainous of the Windward Islands, with an area of 289.5 sq. miles. It is 29 miles long and 16 miles at its widest. The formal name Commonwealth of Dominica is often used to distinguish it from the Dominican Republic. English is the official language but a French-based Creole (kwéyòl) is widely spoken, especially in outlying villages. This reflects a turbulent history in which the island changed hands several times between the French and British. Throughout and to the present day the original inhabitants, the Caribs, tried to coexist. In 1903 they were assigned a 3,700 acre Territory in the north-east where around 3,000 live today. Barbados is the most easterly of the Caribbean islands. Its capital, Bridgetown, is located in the parish of St. Michael. The island is 21 miles long and 14 miles wide(166 sq miles) and is divided into 11 parishes of which, all but two are skirted by the sea. Barbados has been an independent nation since 1966, after three centuries of British rule. The country's capital hosts the 3rd oldest parliament in the Western Hemisphere. An island with a rich and extrodinary heritage, Barbados offers you a host of traditional cultural and historical delights, take a visit to our city and see the famous Lord Nelson statue. This statue was erected in 1813, nearly 30 years before London’s Lord Nelson column. The currency is the Barbados dollar, which is accepted island-wide, and most stores and restaurants accept major credit cards and travellers cheques. 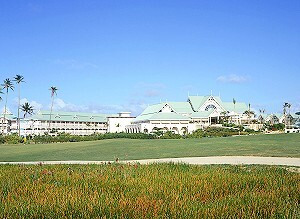 There are many activities one may take part in while vacationing in beautiful Barbados. Swim with the turtles, go on a catamaran cruise, hike hilly terrains, enjoy breath taking arial views on our helicopter tours and do so much more. Barbados has everything for the family, honeymooners, and single travellers, perfect for business and pleasure. It’s an island filled with Adventure. 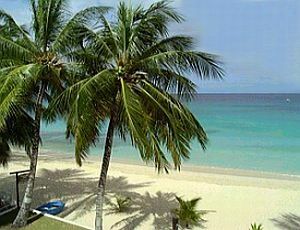 Come to Barbados... Just beyond your Imagination!! !